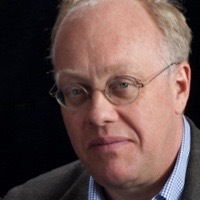 Chris Hedges, who has written, “The rush of battle is often a potent and lethal addiction, for war is a drug,” is a senior fellow at The Nation Institute and publishes a regular column on truthdig.com. Hedges, a veteran war correspondent, has survived ambushes in Central America, imprisonment in Sudan, and a beating by Saudi military police. He is the author of What Every Person Should Know About War, a stark look at the effects of war on combatants and the book War is a Force that Gives Us Meaning. Hedges joined the staff of The New York Times in 1990 and was part of the team that won the 2002 Pulitzer Prize for the paper’s coverage of global terrorism. He spent seven years as The Times Middle East Bureau Chief after having worked for The Dallas Morning News, The Christian Science Monitor, and National Public Radio. In 2002, he received the Amnesty International Global Award for Human Rights Journalism. A graduate of the Harvard Divinity School, Hedges has taught at Columbia University, New York University, and Princeton University. His most recent book is Empire of Illusion: The End of Literacy and the Triumph of Spectacle. His other publications include I Don’t Believe in Atheists and Collateral Damage: America’s War Against Iraqi Civilians. Hedges is currently at work on a book on poverty in the U.S. with the graphic illustrator Joe Sacco.